Around Valentine’s Day, numerous Catholic Schools in the country join in a “Valentine’s Celebration”. On that day, students wear red as they participate in many activities in an effort to raise funds to build more houses for vulnerable Haitian families. Hearts for Haiti is a “faith-in-action” program that empowers and motivates Catholic Youth to share love and compassion for the poorest of the poor. What is hearts for Haiti? After the 2010 earthquake in Haiti, Alexis Darbonne wanted to make a difference in the lives of the poor in Haiti and partnered with Cross Catholic Outreach and Father Glenn Meaux to build houses at the Kobonal Haiti Mission. The original goal of Hearts for Haiti was to engage the Catholic school students of Lafayette, LA to make a tangible difference in the lives of our Haitian brothers and sisters in Christ by providing a safe and sturdy home. While Lafayette schools continue to contribute funds to build homes for deprived families, providing dignity and hope in Christ, and transforming lives over generations, more schools across the U.S. are joining Cross Catholic in this worthy endeavor! 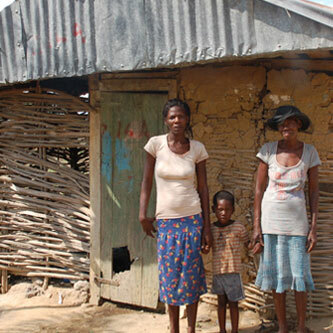 A home in Haiti costs just $6,000. Your parish, school or community group can provide an entire home for a family, or make a matching donation with another group. Please pray about how you can help! Located in Haiti Central Plateau The Kobonal Haiti Mission is Father Glenn Meaux’s labor of love for the poorest country in the Western Hemisphere. The Mission strives to address the most crucial challenges facing the poor – one of which is the urgent need for safe, sturdy shelter. With help from compassionate Catholics like you, many families are being blessed with solid, weather-resistant new houses that include a cement foundation, cinder block walls, a front porch and a galvanized steel roof. Families who have no land are also provided with a small plot they can use to grow fruit trees and vegetables. Many more hopeless families like these need your help for a safe and solid home. Get involved and be instruments of mercy for our brothers and sisters in Haiti! For more information, contact June at 1-800-914-2420 ext. 118 or Alexis in Lafayette at 337-501-4906 to find out more about how to get your school or parish involved. They have great ideas about fundraising and ways to engage your students and parishioners! Our Promise to You! Proceeds from this campaign will be used to cover any expenditures incurred for this project during the current calendar year. In the event that more funds are raised than needed to fully fund the project, the excess funds, if any, will be used to meet the most urgent needs of the ministry.